In 2010, Phaesun off-grid experts from Germany, and Deutsche Investitions- und Entwicklungsgesellschaft (DEG) started a €300,000, three-year rural electrification project in Mozambique, in order to provide electricity to the people of Pessene, located around 50 kilometres from the country’s capital, Maputo. The company established a trader network for the distribution of the Pico systems trained traders in the eastern province of Sofala and Maputo. Less than 10% of the rural population of Mozambique has access to reliable power supply as they are not connected to the national grid. To tackle this situation, German off-grid specialist Phaesun GmbH launched a pilot project in 2010 to provide rural electrification to the parish of Pessene, approximately 50 kilometres from the capital city of Mozambique. The project set out to provide households, small business enterprises and public institutions in Mozambique with solar energy through installation of Pico systems (small off-grid systems with a capacity of up to 10 watts). 50% of the €300 000 project cost was covered by Deutsche Investitions- und Entwicklungsgesellschaft (DEG). The first step of the project consisted of Phaesun establishing a sustained trader network for the distribution of the Pico systems alongside their project partner, Coseba, running training courses for 10 to 15 traders in the province of Sofala in the east of the country. Phaesun cooperation partner Sonnenplus GmbH trained 10 to 15 traders in the province of Maputo. Lectures on photovoltaic technology are now given to students of electrical engineering at the University of Maputo. A specially equipped classroom is available to give the students and dealers of solar system practical training. The project partners also provide the solar experts with basic commercial training and preliminary support in setting up independent solar enterprises. Solar shops and solar kiosks selling systems and renting out lamps have been established to promote local entrepreneurship. By the end of the project in July 2013, 10 solar system dealers had been appointed in the provinces of Sofala and Maputo, 60 technicians and 40 students had been trained in solar technology and a training classroom had been set up in Maputo and training material had been developed. Deutsche Investitions- und Entwicklungsgesellschaft mbH, a subsidiary of KfW, is a European development finance institutions for long-term project and company financing. For 50 years, DEG has been financing and structuring the investments of companies in developing and transition countries in order to contribute to sustainable progress. Founded in 1962 by the first German Minister for Development, Walter Scheel, and the former Minister-President of the German state "Schleswig-Holstein", Kai Uwe v. Hassel, DEG has been working for 50 years on improving the living conditions of the people in its partner countries. In order to do so we advise private companies and finance promising private sector investments. We do this almost entirely with DEG's own funds rather than funds of the Federal Government. DEG invests in profitable projects that contribute to sustainable development in all sectors of the economy, from agriculture to infrastructure and manufacturing to services. The company also focuses on investments in the financial sector in order to facilitate reliable access to capital locally. To date, we have worked together with more than 1,600 companies. Our current portfolio of more than 5.6 billion euros has contributed to an overall investment volume of around 39 billion euros. The private sector development cooperation is an important part of the German development cooperation: successful and long-living private companies generate growth in the company’s cooperation countries. They create jobs and income. They improve the balance of foreign exchange payments by producing competitive goods and they increase tax revenues by processing resources directly within a country rather than exporting them. DEG promotes private sector activities in developing countries in multiple ways: We are a dependable financing partner for private companies. And we pay attention that their investments have substantial positive effects. In doing so, DEG contributes to achieving the Millennium Development Goals - the joint commitment of industrialized and developing nations to combat poverty in a sustainable manner. DEG's purpose is to promote private enterprise initiative in developing and transition countries as a contribution to sustainable growth and a lasting improvement in the living conditions of the local population. Therefore, we provide long-term capital and advice for private enterprises investing in those countries. We only take on commitments in projects that make an effective development policy impact, meet environmental standards and comply with social principles. We are particularly committed to our developmental mandate and our guidelines for social and environmental sustainability: they form the decisive frame of our work. In certain cases, which are summarised in our exclusion list, financing by DEG is excluded from the outset. The list is an integral part of the environmental and social standards adjusted on the basis of the "EDFI Principles for Responsible Financing", which apply within the scope of the European Development Finance Institutions for jointly financed projects. 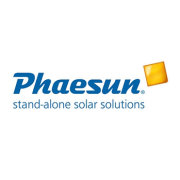 Phaesun GmbH with headquarters in Memmingen, Germany, is a worldwide-operating distribution and service company for solar technology. Phaesun has been specialising in the sales, service and installation of Off-Grid photovoltaic and wind energy systems since it was founded in 2001. Phaesun representations and partner companies are located on four continents around the globe. Thus Phaesun provides a well established network of partners with specific know-how about their market and the corresponding circumstances. The Solar Component and Sales Division is responsible for the wholesaling of selected, high quality Off-Grid-components. With the ONE-STOP SHOP Phaesun provides the most efficient B-to-B market platform for off-grid photovoltaic systems and components. The Solar Systems Installation Division is a service division, realizing entire projects for Off-Grid electrification including system sizing and the design of complete solar systems. Through the experience and the expertise of associated companies Phaesun is able to give customers technical advice on design, engineering and installation of Off-Grid systems for all kinds of applications.